It Is Never Too Late To Start Over! Happy Monday Beautiful People! Are you feeling stuck in an area of your life? It is never too late to start over. If you aren’t happy with yesterday, try something different this week starting today. 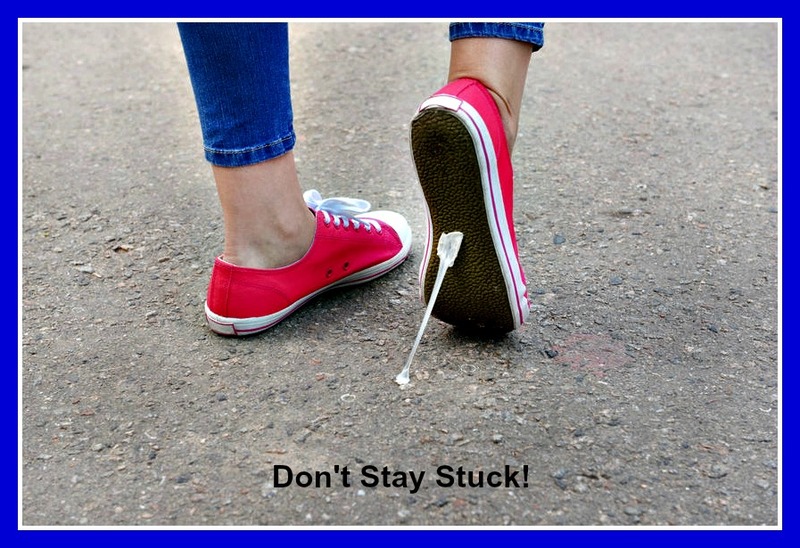 Don’t Stay Stuck! Make a commitment to yourself to do better. Is there an area you are feeling stuck? Please share it with me in the comments below. 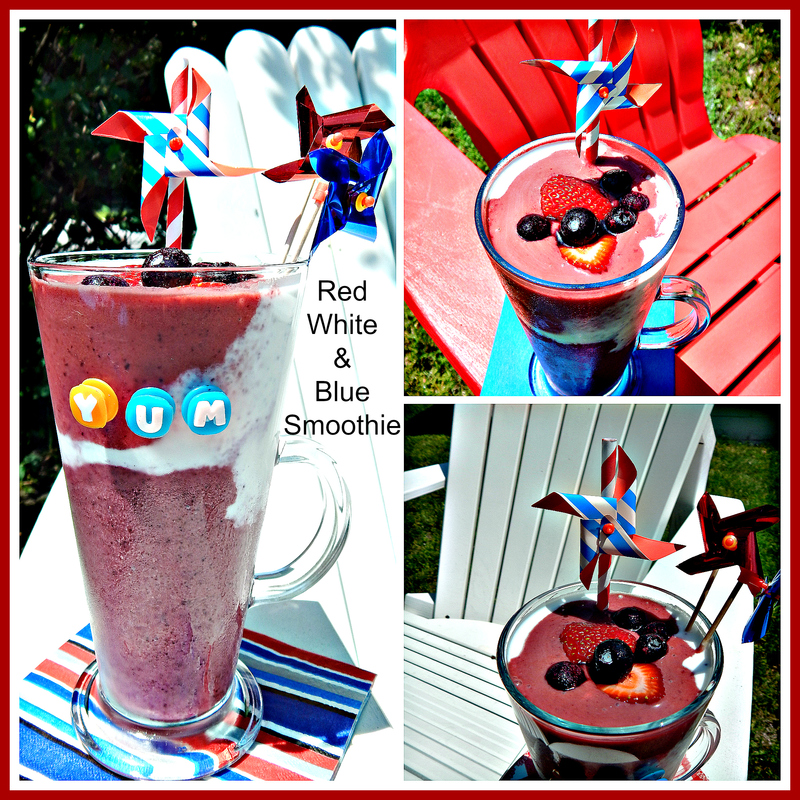 Red, White and Blue Smoothie! Fourth of July is coming up fast! So in honor of the Red, White & Blue, I have a brand new smoothie for you. It is thick, delicious, and you have a protein powder option. There are three layers, but it is not difficult, although it does take about five minutes longer than a regular straight up blended smoothie. It is worth it to do something extra special for yourself. The white layer is simply some creamy full fat coconut milk. This smoothie is packed with clean nutrition. Directions: Blend the Blue Layer. Pour into a clear glass. Gently add the 1/4 cup of coconut milk for the next layer. Blend the Red Layer, Pour on top. Add a few berries and a straw! Note: All the fruit I used was organic. Omit the protein powder for the Specific Carb Diet. Replace Black Cherries for all Strawberries if very Low FodMap. I can’t resist fresh figs when they hit the market in the Summer. They are so elegant and miraculous when you cut them open and see the gorgeous insides. They are artwork and remind me of a kaleidoscope or a fireworks display. Figs are little packages containing calcium, fiber, potassium, iron, Vitamin A, niacin, folate and Vitamin C.
When I go shopping for food to cook for the week, as a nutrient seeker, I have an open mind and am looking for the freshest seasonal produce I can find. When I get it home, I decide what to do with it and get into my creative mode, which I find very therapeutic and rewarding. 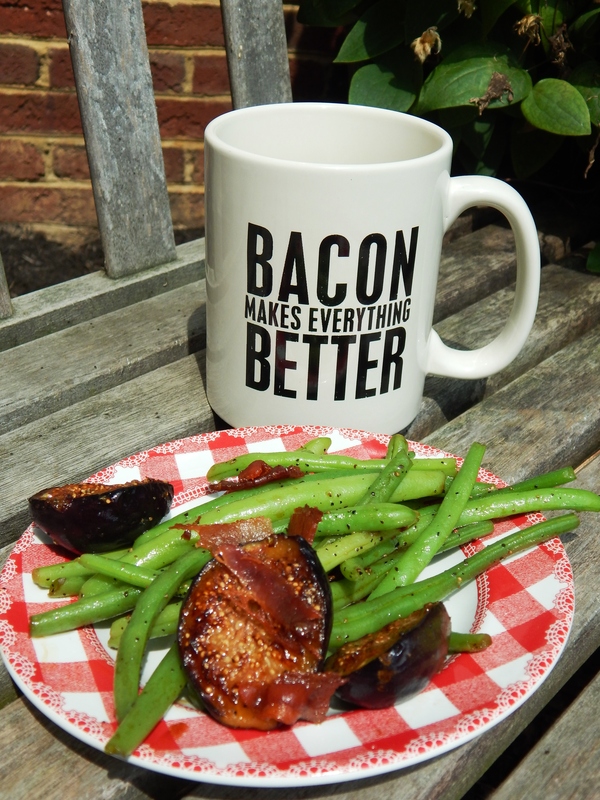 This week I found fresh green beans, fresh figs, and some good quality organic bacon. 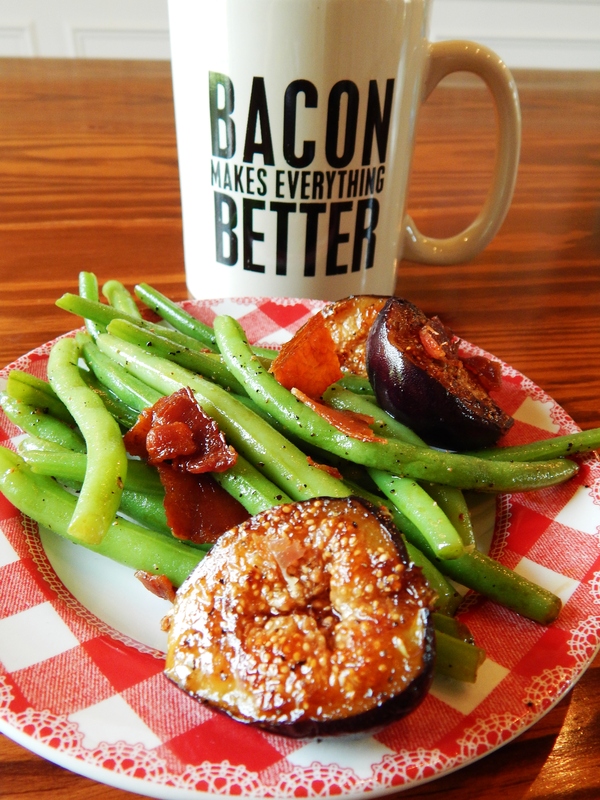 A little bacon goes a long way to flavor a dish. I used two slices, but if you want more, feel free to embellish. The figs are halved and caramelized in olive oil which makes them sweeter. The natural sugars in the figs cause them to caramelize without any added sugar. They are natures perfect little plump package. Directions: In a large fry pan, warm olive oil over medium heat. 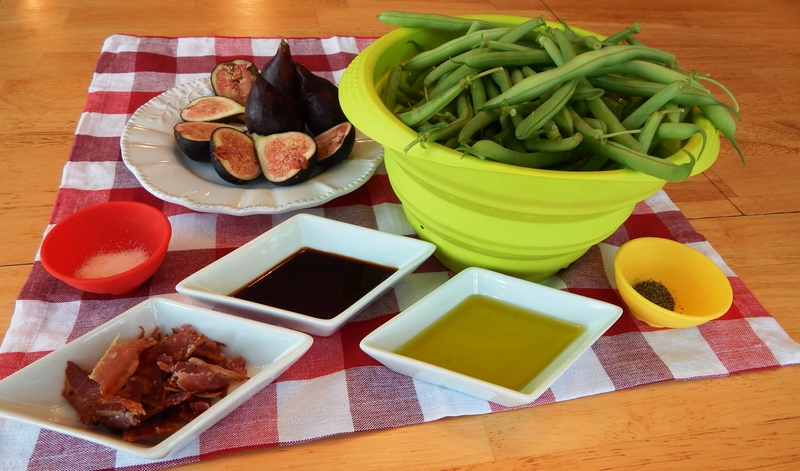 Place the figs in a single layer cut side down, and sautee until caramelized (about 2 minutes). Add steamed beans, salt and pepper, and gently toss with tongs to coat and warm the green beans. Add the balsamic and continue cooking until the balsamic forms a glaze. This will be accomplished quickly. Plate and sprinkle with crumbled bacon and a pinch or two of Fleur de Sel finishing salt. I have an assignment for you this month to invest in your healthy life and longevity. Try one new vegetable and fruit from the produce isle each week. Swap it out for something you would eat processed, and eliminate that one processed food in place of a fresh, whole fruit or vegetable each day. If you need ideas, here is a Fruit and Vegetable List you can print and take to the store, or just browse the produce isle for interesting fruits and vegetables you haven’t tried before or haven’t had in a long time. Go home and Google recipes for what you buy. Remember, creating healthy habits that last a lifetime happens one step at a time. This recipe is a delicious one that you will really enjoy, and it is beautiful to the eyes and body. Good Morning Gorgeous!!! Yes, you are a gorgeous person! 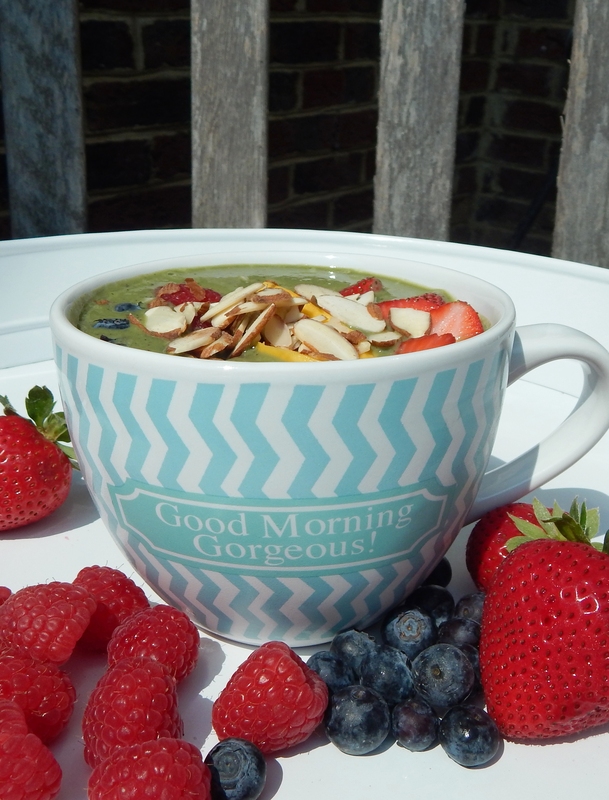 Today I have a fantastic new Smoothie Bowl Recipe to share with you that will help make your insides gorgeous too, and when we are gorgeous on the inside, it naturally makes us glow outward! Wouldn’t you agree? 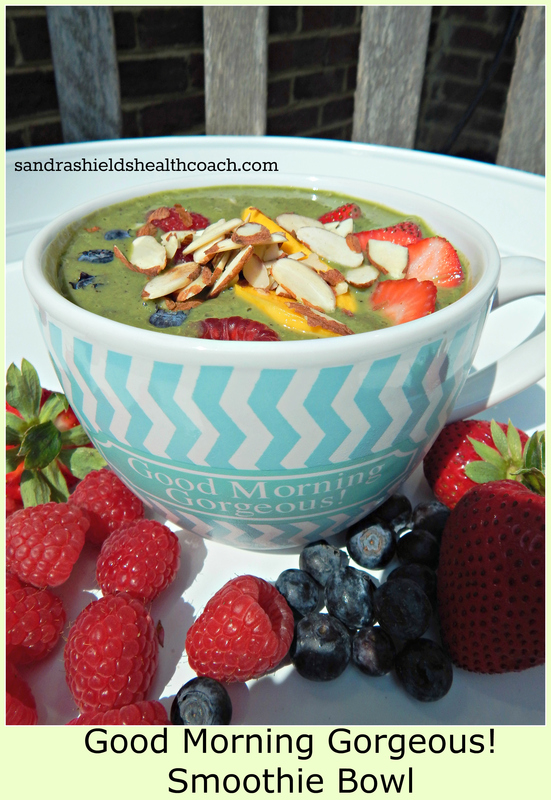 This smoothie is a nourishing breakfast bowl full of only real food, fiber, protein, and you are getting in a serving of greens all in an easily assimilated, highly digestible way! I am a big fan of smoothies in the morning, because our digestive system has been resting as we sleep. It is an optimal time to put a blended meal in our bodies to quickly absorb the nutrients and keep us energized throughout the morning, with just the right amount of calories. This smoothie has low sugar berries, banana and a few slices of mango. The flax helps keep you regular, the seed butter adds healthy fat and protein, and the sliced almonds add crunch! Here is the recipe. I highly recommend you give this a try! It is such a beautiful way to start your day. The colors nourish your soul (we eat with our eyes too!) and the food nourishes your body. Make a commitment today to do this for yourself! Directions: Place all the ingredients into a blender except the Sliced Almonds and Mango and reserving some each of the Raspberries, Strawberries and Blueberries to scatter on the top. Blend on high until smooth. Pour into a bowl (or bowl mug). I am a fan of Affirmation Bowl Mugs like this one. Scatter with reserved berries, a few slices of mango, and sliced almonds. Sit down and savor this highly nourishing breakfast. It is a wonderful way to care for your body that will be your home while on this planet! You can find out more about my Health Coaching on my Website: sandrashieldshealthcoach.com and sign up for my free monthly Health Coaching newsletter (different from my blog newsletter) for tips on creating healthy habits that will last a lifetime! Are You Getting Enough Primary Food? Have you heard of Primary Food and Secondary Food? I am going to challenge you today to work on getting your Primary Food in balance! Below you can take a quiz to see how you are doing in the twelve Primary Food areas. Taking small steps to work on areas in your life where your Primary Food needs improvement makes a big difference over time. A challenge for you over the next several days is to make sure you get outside daily and do something that involves moving your body! This can be anything outdoors that you enjoy! Gardening, Sports, Fishing, Jump Roping, Hula Hooping, Walking, Playing, Exercising, Looking at the Sky, Going Barefoot in the Grass, and more. Pick something you Love! You will be getting Vitamin D from the sun, fresher air (since indoor air can be the most polluted air we breathe), physical activity, and joy from getting in touch with nature. As a Health Coach, I help my clients improve upon not only optimizing their nutrition (Secondary Food), but Primary Food as well in order to have a balanced and healthy life. If your Primary Foods are out of balance, it can be difficult to be completely healthy even though you may be eating an optimal diet full of vegetables, fruit, healthy carbohydrates, good fats, protein, fiber, and drinking plenty of water. This week make a point of being outdoors more, at least 30 minutes a day. 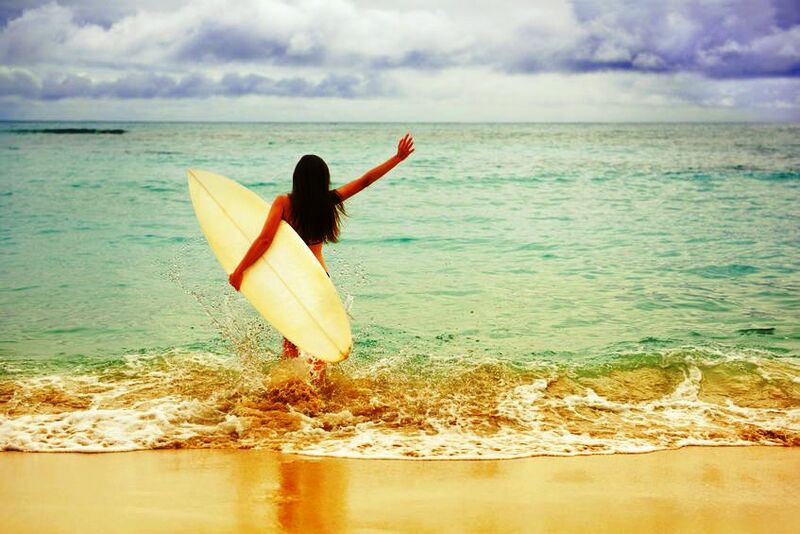 Just going outside covers at least three of the Primary Food Categories (Health, Physical Activity and Joy). More can be added while outdoors, the choice is yours, for instance if you are spending time outside with another person you could be working on Social Life or Relationships. Secondary Food is the Food we eat. Check out previous posts for nutrition tips. What steps could you take to work on your Primary Food? Share with me an area you would like to improve and an area that you feel you are doing very well in below. I have a brand new, Low FodMap, absolutely delicious barbecue sauce that I have been making a lot! It is so good! You can use it for all your barbecue favorites! 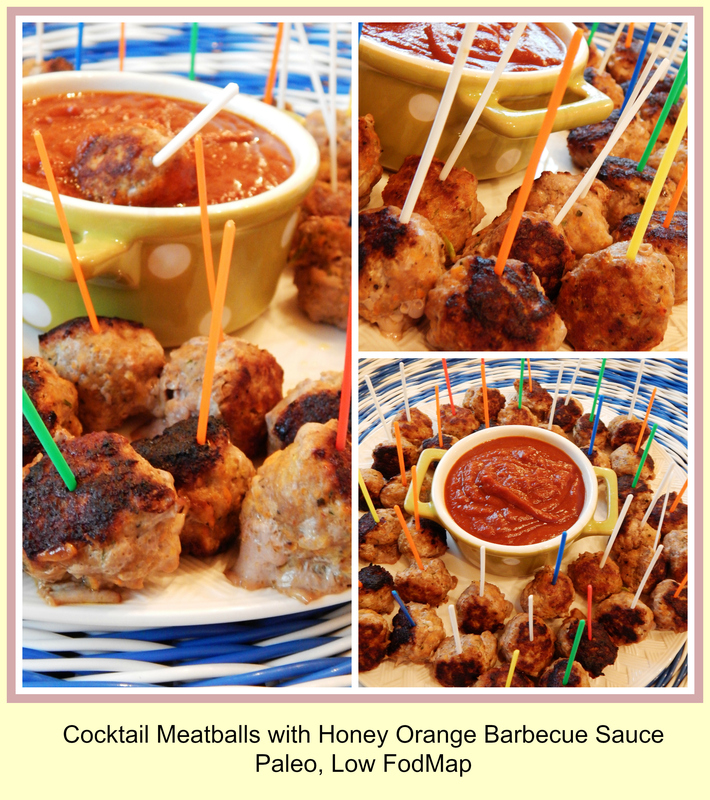 Today I paired it with a new cocktail meatball recipe I served recently at a potluck I hosted here at my house. I doubled the recipe, and they all disappeared fast, plus I received requests for the recipe! I am so excited to share it here with you today, and for all my loyal low fodmap followers, it is completely low fodmap! You are going to love this recipe! 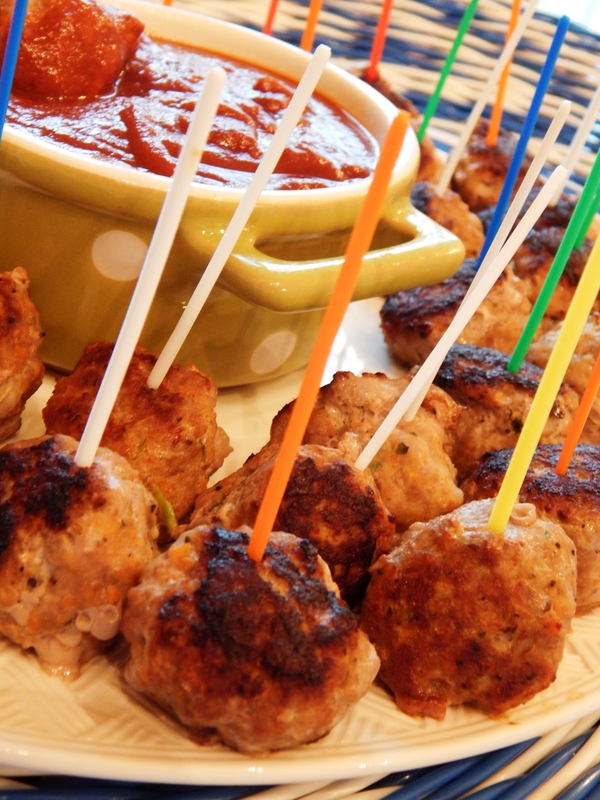 The meatballs are moist and are made with ground pork and turkey. You can make a large batch of the barbecue sauce and freeze half of it to pull out of the freezer for later. (Cook once, eat twice convenience!) I like to double the recipe for four jars of sauce and freeze three to pull out as needed. Directions: Place all ingredients in a medium sauce pot. Bring to a boil, then turn down to a very low simmer. Simmer on the stovetop for 30 to 40 minutes until the sauce is reduced by half. If you are doubling the recipe, it will take a little longer. Cool sauce for 30 minutes, then puree it until smooth in a blender. It is ready! Pour it into glass jars for later use, freeze half, serve it right now! Preheat your oven to 350º degrees. I like to use a large oven safe non-stick pan to go from stove top to oven. nonstick double griddle. If you do not have one, line a cookie sheet with parchment. Directions: Place the green onion and carrot in a small food processor and process until finely chopped. Place the remaining ingredients in a large mixing bowl. Add all the ingredients to the bowl (just two tablespoons of the olive oil, reserving the other two tablespoons for browning the meatballs). Add the green onion and carrot and thoroughly mix the meatball ingredients with your hands. 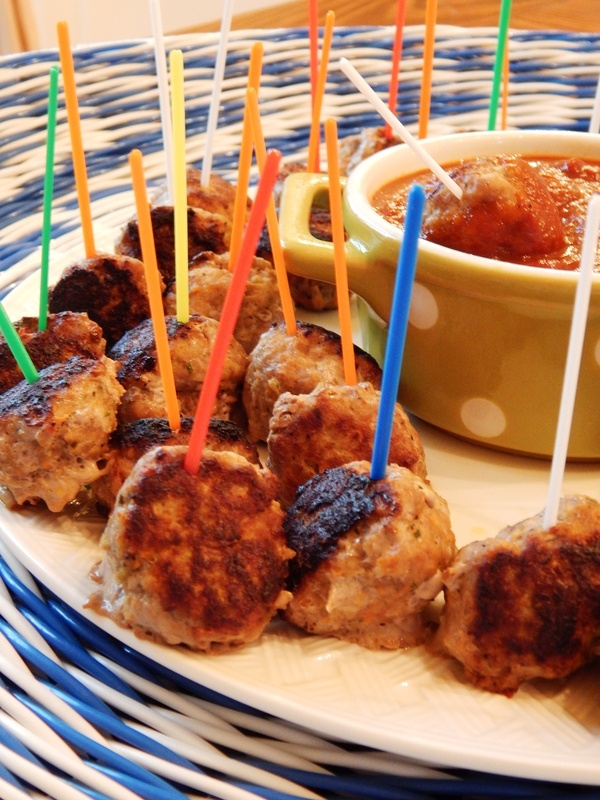 Using a tablespoon cookie scoop, scoop uniform sized scoops of meatballs. You will have approximately 40. Once they are all scooped, form them into smooth balls with your hands. Now, warm the remaining two tablespoons of olive oil over medium-high heat on the stove top in your oven safe pan. When the oil sizzles when a meatball is added, add all the meatballs to the pan. Brown for three minutes, turn gently, and brown another two to three minutes. They will still be pink in the middle. 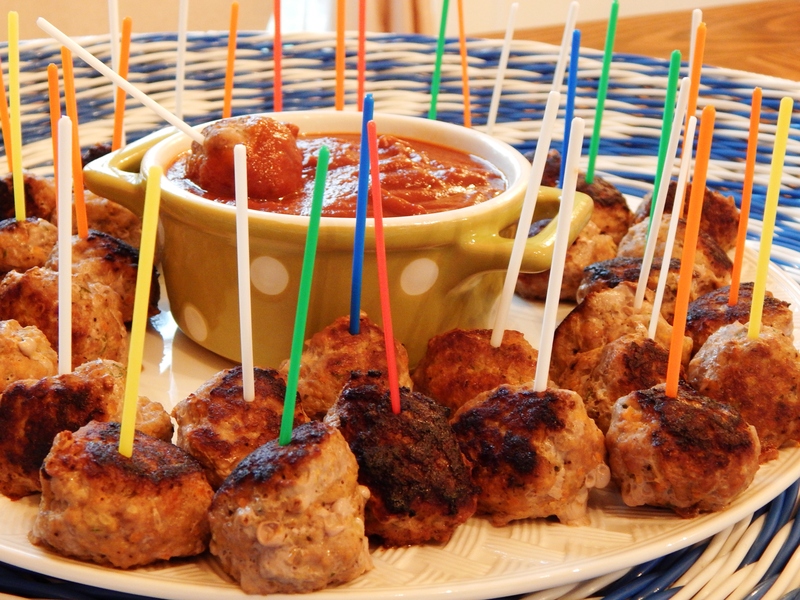 Now transfer the meatballs to the oven, and bake for 7 to 10 minutes until the internal temperature reaches 165º degrees. Keep a close eye on them so they don’t overcook and stay as moist as possible! 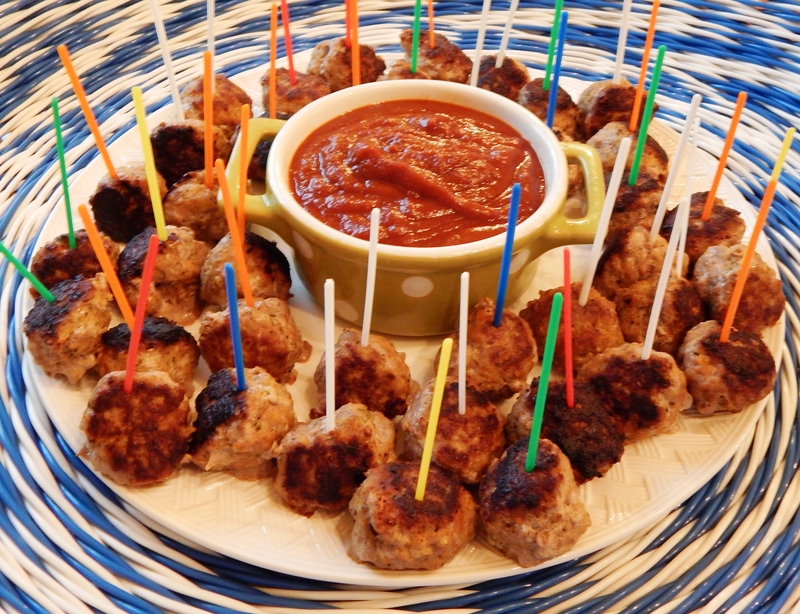 Remove from the oven and insert toothpicks for easy eating, and serve with the barbecue sauce! If you love this recipe, please leave me a rating and comment below, also I would love you to share it with friends by hitting the Pinning, Tweeting or Facebook buttons! 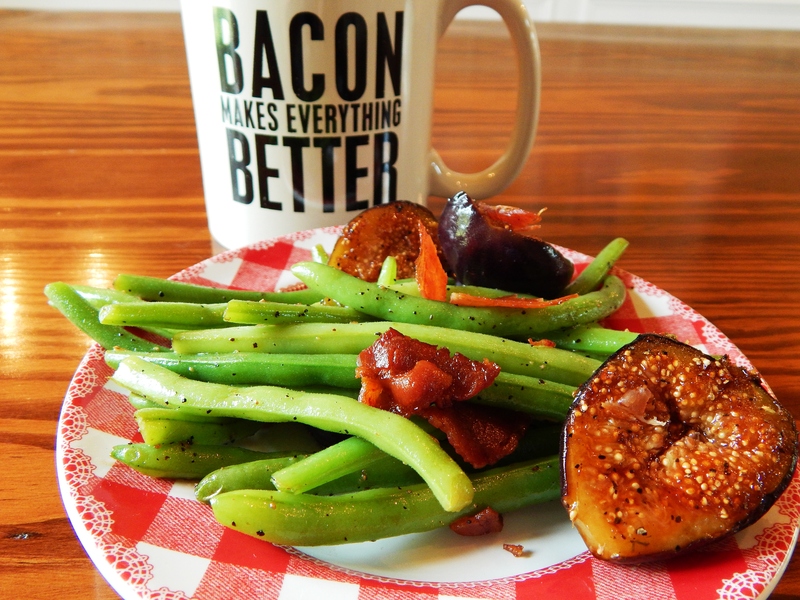 Like to see a new recipe that is low fodmap and paleo? 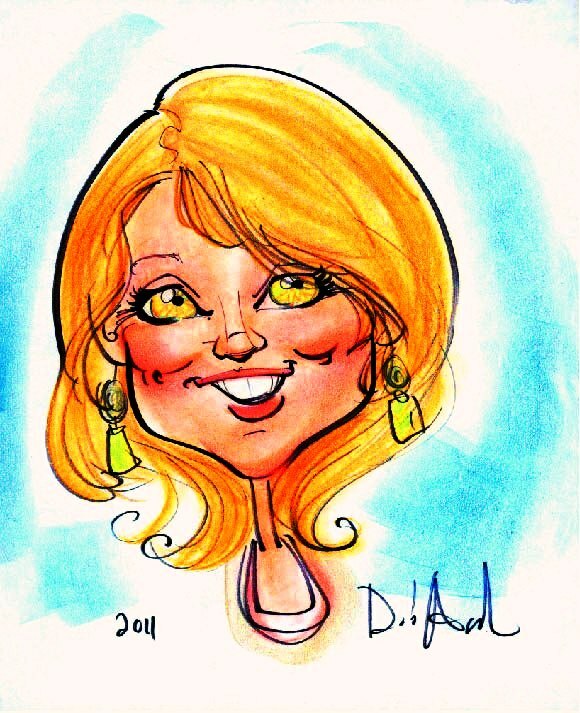 Share your ideas with me, and I will see what I can do!